A continuous update of the various applications and assessments of technological advances and innovations of imaging systems is required to assess their merits and demerits and their guidelines for utilization. The purpose of this review is to update orthodontists about the current options and applications of the latest imaging techniques in orthodontic practice and to review the existing software advances. Quantitative radiology (QR) s.r.l. (NewTom 9000) introduced cone beam technology for the first time in the European market in 1996 and into the US market in 2001. On October 25, 2013, during the “Festival della Scienza” in Genova, Italy, the original members of the research group: Attilio Tacconi, Piero Mozzo, Daniele Godi, and Giordano Ronca received an award for the CBCT invention. It was a revolutionary invention which changed the world's dental radiology panorama. As CT scans were now frequently used for standard treatment plans, it became necessary to develop a cheaper, lower dose method of obtaining radiographic 3D volume. QR, recognizing this need, brought the first CBCT scanners into the medical arena in 1997. CBCT scanners utilize a 2D detector. A single rotation of the gantry is required to obtain a scan of the entire region of interest, whereas image is obtained by stacking multiple “slices” in conventional CT scanners. The advantages of CBCT over conventional fan-beam or spiral-scan geometries are higher efficiency in X-ray use, quick acquisition of volumetric data, and less costly. Currently, flat panel detector technology is used in CBCT. It allows the adoption of a seated or standing position for the patient as opposed to supine, a more relaxing situation for nervous patients. In dentistry, this technology was introduced between the years of 1998 and 1999. A source of conical-shaped ionizing radiation is directed through the middle of the area of interest toward an area of X-ray detection at the opposite side. The radiation source and the detector rotate around a fixed fulcrum inside the center of the area of interest. It is difficult to precisely diagnose and treat impacted and transposed teeth, hence they are one of the most challenging cases in orthodontics. Difficulty in accurately visualizing the location, angulation, spatial position, and relationships of the tooth in three dimensions using conventional 2D radiographs is a problem that leads to complexity in treating impacted teeth. There is a strong research evidence justifying the use of CBCT for impacted teeth. Occlusal and periapical radiographs traditionally have been utilized to localize the position of the canine using the “same lingual, opposite buccal” (SLOB) rule. This rule generally focuses on localizing the 2D buccolingual position of the impacted tooth's crown rather than detailing the entire tooth's 3D spatial position and its relationship to the surrounding structures. The development of research on CBCT imaging to localize impacted canines has made the limitations of making treatment decisions using the SLOB rule and conventional 2D radiographs increasingly evident. In a study by Haney et al., the investigators sought responses from a group of orthodontists and oral and maxillofacial surgeons regarding the location and site of surgical access for impacted canines using conventional 2D radiographs (panoramic, occlusal, and two periapicals) versus CBCT images. An approximate 20% lack of agreement was seen among clinicians regarding the palatal versus labial location of the tooth tip between the two imaging modalities. There was also a lack of agreement on which side to start the surgical access. This implied that an accurate identification of tooth tip location has a direct effect on the site of surgical access. The radiographic modality greatly influenced the initial force vector for planning forced recovery of the tooth. Specifically, when these teeth were evaluated with 3D images, the vector was changed for 11 of 12 teeth judged to have an initial distal recovery vector on 2D images. There was higher success rate and confidence with CBCT in diagnosis and treatment planning relative to the combination of panoramic, periapical, and occlusal radiographs. Alqerban et al. tried to compare 3D CBCT images of patients with unilaterally impacted canines and to determine the possible radiographic factors for prediction of maxillary canine impactions. They formulated an equation for checking the probability of impaction of canine using CBCT [Figure 1]. The probability of true impaction is exp (μ)/(1 + exp [μ]), where μ = −5.66 + 2.11 × x1 +3.28 × x2 +0.27 × x3 +0.11 × x4, with x1 =1 if the canine crown position is buccally oriented and x1 =0 if not; x2 =1 if the canine crown position is palatally oriented and x2 =0 if not; x3 is the linear measurement from canine cusp tip to the occlusal plane in the sagittal view (in millimeters); and x4 is the canine angle to the lateral incisor in the coronal view (measured in degrees). They concluded that prediction of the probability of canine impaction based on CBCT was excellent. CBCT is more sensitive than 2D radiographs in detecting root resorption associated with impacted canines. In individuals with impacted canines, 2D radiographs reveal root resorption in 30%–50% of lateral incisors, while CBCT reveals root resorption in at least another 65%. Thus, it is not surprising that CBCT is considered very useful by 71% of clinicians, while only 9% say the same about conventional 2D radiographs. CBCT contributes to changes in treatment decisions in approximately 30% of the cases., The data from CBCT should be utilized fully to change or modify treatment plans and to use optimal retrieval mechanics. The conventional CT and CBCT scans can be used to visualize the airway extending from the tip of the nose to the superior end of the trachea. The functional and developmental relationships between some structures such as the jaws, teeth, cranial base, spine, and facial soft tissues can be evaluated accurately with the help of these 3D imaging techniques. The reduced nasopharyngeal space – either by the presence of adenoids or due to the narrow anatomical structure of the nasopharynx – can determine the resulting functional imbalance and its impact on craniofacial growth and development, causing the adenoid face or long face syndrome.,, CBCT is potentially useful for assessing the relative positions of the mandible and maxilla since a posteriorly placed mandible predisposes to airway obstruction and difficulty with intubation. CBCT being a 3D imaging technique allows clinicians to assess the airway space and surrounding structures to determine nasopharyngeal, oropharyngeal, and hypopharyngeal measurements, such as the most constricted area, volume, and the smallest anteroposterior and lateral pharyngeal dimensions in obstructive sleep apnea syndrome (OSAS) patients. Unlike nasopharyngoscopy, CBCT also provides information regarding changes in the soft tissue surrounding the airway. The changes caused by treatment modalities can be evaluated using CBCT and which patients would benefit from the various different treatment modalities can be identified. Haskell et al. asserted that it was possible to predict the amount of increase in total volume and in the cross-sectional area of the oropharynx obtained through appliance-induced mandibular advancement as the most constricted area could move to a higher or lower point in the pharynx. Hence, CT evaluation would be necessary prior to installing the appliance so as to check whether its use would benefit the patient. While treating OSAS patients, improvement in the most constricted area is more important than to increase the volume of the pharynx as a whole. Felippe et al. studied relationship between rapid palatal expansion and airway resistance using 3D imaging and acoustic rhinometry in 38 patients. There was a mean short-term reduction in nasal airway resistance. Concomitant with this, a mean increase in palatal area, volume, and intermolar distance was also obtained. In the long term, the mean palatal area and intermolar distances reduced toward pretreatment values, while the nasal cavity volume and minimal cross-sectional airway increased. Thus, CBCT can be used to assess postexpansion effects. Assessment of airway changes after myofunctional appliance therapy can be evaluated using CBCT. Li et al. studied the morphological changes of upper airway after twin block treatment in thirty growing patients with Class II division 1 malocclusion and mandibular retrusion compared with untreated Class II patients by CBCT. They found a significant enlargement in the oropharynx and hypopharynx in Class II division 1 malocclusion and mandibular retrusion-treated patients, compared to the untreated Class II patients. The temporomandibular joint (TMJ) is one of the most important structures in clinical orthodontics. TMJ pathologies can result in changes in the size, form, and spatial and functional relationships of the joint components. This leads to progressive changes and compensations of TMJ components that ultimately affect the jaw and tooth positions and occlusion. The pathological TMJ conditions are TMJ disorders (also referred to as temporomandibular disorders) and developmental disorders such as condylar hyperplasia, hypoplasia, or aplasia. Progressive anterior openbite and limitation or deviation of jaw movements are some of the consequences seen associated with these pathological conditions. A panoramic radiograph orthopantomogram is a routine radiograph taken in orthodontics for diagnosis and treatment planning. For more detailed information about the bony structures of the TMJ, radiographs such as conventional transpharyngeal radiographs or multidetector CT scans can be taken, and magnetic resonance images (MRI) will give information about the surrounding soft tissues and the articular disc. Recently, CBCT has been developed as an alternative to conventional CT for the diagnosis of TMJ disorders. Honey et al. compared the reliability of CBCT imaging of the TMJ complex with panoramic radiography and linear tomographic views and found that the CBCT images were more accurate and reliable in diagnosing various condylar morphology disturbances and erosion. In a retrospective study, CBCT images of thirty patients treated with the twin block appliance were obtained. Pre- and post-treatment (T0 and T1) condylar volume was compared. They concluded that twin block appliance stimulates the growth of condyle in an upward and backward direction and thus increases mandibular length, condylar volume, and intercondylar distance. A full field of view CBCT scan is used to evaluate the size of the coronoid process in coronoid hyperplasia patients and is acquired in the open mouth position to demonstrate the exact contact point of the coronoid process with the zygomatic arch or posterior aspect of the maxilla. Essential information for diagnosing inflammatory and degenerative conditions of the TMJ bony tissues can be obtained by 3D imaging of the TMJ. CBCT also aids in monitoring progression and thus responses to treatment. Various conditions such as osteoarthritis, rheumatoid arthritis, idiopathic condylar resorption, juvenile idiopathic arthritis, gout, ankylosing spondylitis, psoriatic arthritis, and other less common diseases can be diagnosed using CBCT. When CBCT is used for routine orthodontic reasons, early detection of TMJ degenerative processes can be done in an otherwise asymptomatic patient. Articular disc is not visualized on CBCT examinations – MRI is used for evaluating the disc position. Nevertheless, some CBCT findings, although not confirmatory, raise the suspicion of internal derangements. For example, disc displacements cause posterior positioning of the condylar head within the glenoid fossa. Frequently, in the case of disc displacement without reduction, there may be limited translational motion of the condyle. Both these changes are manifested on CBCT scans. MRI is then used to provide definitive diagnosis in clinical suspicion cases. CBCT imaging demonstrates the condylar fracture location (intracapsular, extracapsular, or subcondylar), its direction, and the presence and degree of displacement. CBCT examination has important diagnostic and therapeutic implications in TMJ ankylosis. It can be used for diagnosing bony ankylosis and allows evaluation of the extent of the bony union and can differentiate between bony and fibrous ankylosis. CBCT can also be used for diagnosing synovial chondromatosis which is due to chondrometaplasia of the synovial joint tissues. Synovial chondromatosis [Figure 2] manifests as widened joint space, presence of multiple, calcified, loose bodies in the joint space, and irregular or sclerotic glenoid fossa on CBCT images. Scans in the open mouth position often demonstrate a change in the positions of these calcified bodies. Anchorage is the cornerstone of the orthodontic force system. Various techniques to reinforce anchorage have been used in orthodontic practice. 2D imaging proves insufficient in providing adequate information regarding the root morphology, thickness of cortical bone, interradicular space, and the position of the inferior alveolar nerve., CBCT scans of the potential placement help with preoperative planning and preparation and thus, it plays a key role in the success of orthodontic mini-implants. CBCT also provides information regarding the proximity of the nerves, the course of nerves, and hence decreases the possibility of violating these structures. Morea et al. used stereolithographic surgical guides fabricated from a CBCT scan. Using this group's technique, the placement of the tip-apex distances (TADs) averaged <1 mm displacement and <2° variation from its planned position. This approach has advantages of good precision and is easy for inexperienced clinicians, while its limitations are greater cost and increased treatment time because the scan and implant insertion cannot be performed on the same day as guide fabrication is a laboratory procedure that takes time. CBCT technology is a valuable instrument for managing insertion torque. It provides pretreatment information on the anatomical properties of the implant site including the important microanatomical factors, namely cortical bone thickness and cortical bone density. CBCT thus helps the clinician to choose the most appropriate implant site and constitutes a powerful aid in determining which implant insertion protocol may be best at any given implant site. CBCT scan provides information on the cortical bone thickness at the insertion site, and thus helps in determining the insertion torque range to be expected. If the cortical bone falls into a range offering the ideal torque, a direct insertion without any further implant site preparation would be the preferred approach to miniscrew implant placement. If the cortical bone is expected to offer excessive torque, predrilling is necessary into the insertion protocol to lower the insertion torque into the ideal range and increase the possibility for a successful insertion and longevity of the TAD. Virtual miniscrew implant insertion serves as an aid to avoid dental roots or other anatomical structures during TAD insertion. The final position of the plate during surgery can be determined using virtual placement of the pilot holes and mini-plate on the CBCT image, using software. Several studies have proposed virtual treatment planning to achieve higher surgical success rates., The main advantage of virtual mini-implant placement is preoperative adaptation of the mini-plates on the model surface. It allows for maximum contact between the plate and the bony surface during the surgery and thus reduces the risk for infection and the probability of mini-plate failure. Cleft lip and palate (CLP) are one of the most common birth defects. There is esthetic disfigurement, functional morbidity such as restricted maxillofacial growth, swallowing, and feeding difficulties, speech anomalies, recurrent ear infections, and hearing loss seen in children with cleft lip and/or palate. There are many advantages offered by CBCT for imaging of patients with CLP such as the rapid acquisition time ranging from 5.7 to 40 s which is a great advantage for young patients and for patients who are uncooperative or have difficulty remaining stationary. Other advantages are lower radiation dose for the patient which is favorable for subsequent imaging sessions decreasing the total cumulative radiation dose. For osteoplasties, CBCT provides valuable information on the morphology of the bone defect, the proximity of adjacent teeth, and assessment of the size and volume of the bony defect. This allows the clinicians to estimate the amount of bone required to repair the defect. This can be very helpful in surgical treatment planning, especially in cleft patients where autologous bone grafting is a common procedure. In a study by Hamada et al., they compared CBCT (dental 3D CT) with dental occlusal and panoramic radiographs to evaluate bone grafts of the alveolar cleft. More precise information about 3D morphology of the bone bridge at the cleft site was obtained using CBCT. It also helps in evaluating the 3D relationships between the bone bridge and the roots of the teeth adjacent to the cleft. It also provided more information about the bone support of teeth adjacent to the cleft, alveolar bony architecture, and better assessment of the alveolar bone graft for placement of dental implants. CBCT provides many advantages to surgeons preoperatively as well as for evaluating the results of an orthognathic surgery. It is used for preoperative assessment of bone support of the dentition and interdental spacing for interdental osteotomies. Postoperative assessment with CBCT allows a high-resolution determination of osteotomies and fixation. The surgeons can then evaluate their results critically and avoid making the same mistakes and facilitate evolution in their techniques. 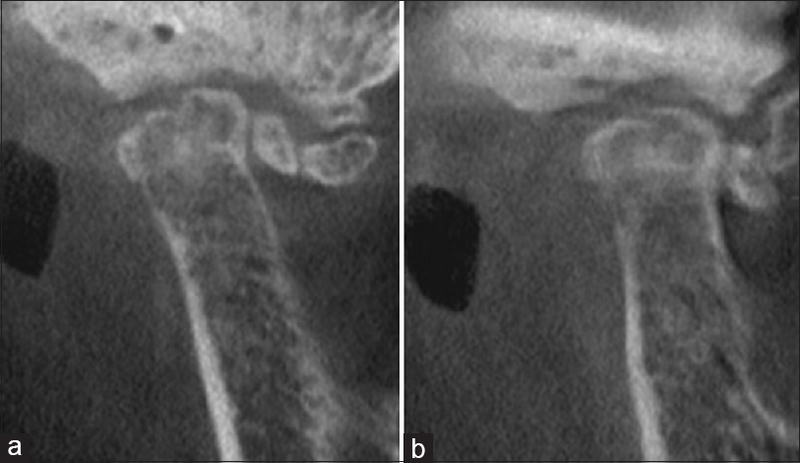 For example, CBCT enables (1) the evaluation of the incidence and position of deflected septums and pterygoid plate fractures after LeFort osteotomies; (2) good visualization of the position of the Hunsuck fracture in the bilateral sagittal split osteotomy; (3) visualization and documentation of presurgical centric relation and postoperative alterations in condylar position, condylar anatomy, also errors in achieving centric relation; and (4) pre- and post-surgical superimpositions performed to document condylar changes and thus to elucidate the precision in achieving preoperative plans. The occlusal surgical splints obtained by computer-assisted orthognathic surgery (CAOS) is similar to that produced in conventional planning methods and thus this method is readily accepted by the oral and maxillofacial surgeons. The virtual model of a patient's skull and occlusion is obtained using CT or CBCT images and dental models. These data are manipulated virtually to simulate the desired surgical plan. The data are then exported to rapid prototyping hardware so as to generate templates that will guide the operation. The operation and its results will match the virtual plan if the process and the templates are effective. Thus, CAOS is dependent on specialized software. It permits analysis, surgical simulation, and design and fabrication of surgical splints. CBCT provides the great advantage of predicting the postoperative results (Kiyak et al., 1988). There is difficulty in importing 2D cephalometric data to model surgery. The next stage in the evolution of computerized 3D treatment planning is computer-aided design and computer-aided manufacturing technology used to manufacture surgical splints for use in orthognathic surgery. It enables 3D physical structures to be obtained from 3D images. Technology is constantly changing and new applications arise almost daily. There will be greater improvement in orthodontic diagnosis and treatment with the future developments in this field. The long-awaited incorporation of the 3D is soon becoming a reality. CBCT is the future wave in orthodontics and its applications in orthodontics seem almost infinite. The following applications of CBCT technology give a glimpse of what may be available in the near future. There is ongoing research and development of future applications of CBCT. These are simulation, growth prediction, forensics, modeling, and manufacturing. 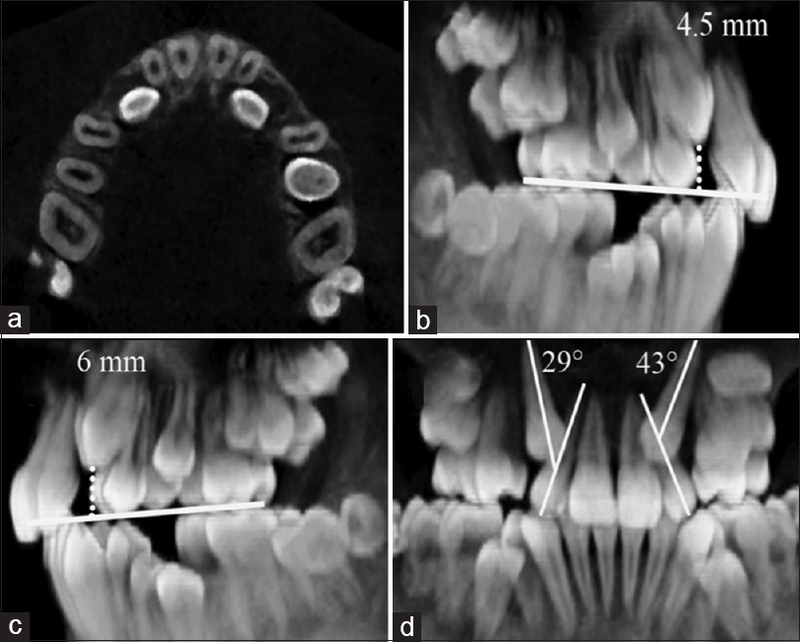 Nakajima A, Sameshima GT, Arai Y, Homme Y, Shimizu N, Dougherty H Sr. Two- and three-dimensional orthodontic imaging using limited cone beam-computed tomography. Angle Orthod 2005;75:895-903. Ambrose J. Computerized transverse axial scanning (tomography). 2. Clinical application. Br J Radiol 1973;46:1023-47. Arai Y, Tammisalo E, Iwai K, Hashimoto K, Shinoda K. Development of a compact computed tomographic apparatus for dental use. Dentomaxillofac Radiol 1999;28:245-8. Gribel BF, Gribel MN, Frazäo DC, McNamara JA Jr., Manzi FR. Accuracy and reliability of craniometric measurements on lateral cephalometry and 3D measurements on CBCT scans. Angle Orthod 2011;81:26-35. Kima J, Heob G, Lagravèreb MO. Accuracy of laser-scanned models compared to plaster models and cone-beam computed tomography. Angle Orthod 2014;84:443-50. Kapila S, Conley RS, Harrell WE Jr. The current status of cone beam computed tomography imaging in orthodontics. Dentomaxillofac Radiol 2011;40:24-34. Sukovic P. Cone Beam Computed Tomography in Dentomaxillofacial Imaging. AADMRT Newsletter; 2004. Available from: http://www.aadmrt.com/uploads/2/5/4/0/25405419/aadmrt_newsletter_winter_2004.pdf. [Last accessed on 2017 Apr 10]. Kapila SD. Cone Beam Computed Tomography in Orthodontics: Indications, Insights, and Innovations. 1st ed. Ann Arbor: Wiley Publishers; 2014. Haney E, Gansky SA, Lee JS, Johnson E, Maki K, Miller AJ, et al. Comparative analysis of traditional radiographs and cone-beam computed tomography volumetric images in the diagnosis and treatment planning of maxillary impacted canines. Am J Orthod Dentofacial Orthop 2010;137:590-7. Alqerban A, Jacobs R, Fieuws S, Willems G. Radiographic predictors for maxillary canine impaction. Am J Orthod Dentofacial Orthop 2015;147:345-54. Botticelli S, Verna C, Cattaneo PM, Heidmann J, Melsen B. Two- versus three-dimensional imaging in subjects with unerupted maxillary canines. Eur J Orthod 2011;33:344-9. Vig KW. Nasal obstruction and facial growth: The strength of evidence for clinical assumptions. Am J Orthod Dentofacial Orthop 1998;113:603-11. Hartgerink DV, Vig PS. Lower anterior face height and lip incompetence do not predict nasal airway obstruction. Angle Orthod 1989;59:17-23. Fourie Z, Damstra J, Gerrits PO, Ren Y. Accuracy and reliability of facial soft tissue depth measurements using cone beam computer tomography. Forensic Sci Int 2010;199:9-14. Haskell JA, McCrillis J, Haskell BS, Scheetz JP, Scarfe WC, Farman AG. Effects of mandibular advancement device (MAD) on airway dimensions assessed with cone-beam computed tomography. Semin Orthod 2009;15:132-58. Felippe OD, Da Silveria AC, Viana G, Kusnoto B, Smith B, Evansf C. Relationship between rapid maxillary expansion and nasal cavity size and airway resistance: Short- and long-term effects. Am J Orthod Dentofacial Orthop 2008;134:370-82. Li L, Liu H, Cheng H, Han Y, Wang C, Chen Y, et al. CBCT evaluation of the upper airway morphological changes in growing patients of class II division 1 malocclusion with mandibular retrusion using twin block appliance: A comparative research. PLoS One 2014;9:e94378. Chen MJ, Yang C, Zhang XH, Qiu YT. Synovial chondromatosis originally arising in the lower compartment of temporomandibular joint: A case report and literature review. J Craniomaxillofac Surg 2011;39:459-62. Costa e Silva AP, Antunes JL, Cavalcanti MG. Interpretation of mandibular condyle fractures using 2D- and 3D-computed tomography. Braz Dent J 2003;14:203-8. Anjos Pontual ML, Freire JSL, Barbosa JMN, Frazão MAG, dos Anjos Pontual A, Fonseca da Silveira MM. Evaluation of bone changes in the temporomandibular joint using cone beam CT. Dentomaxillofac Radiol 2012;41:24-9. Jung YR, Kim SC, Kang KH, Cho JH, Lee EH, Chang NY, et al. Placement angle effects on the success rate of orthodontic microimplants and other factors with cone-beam computed tomography. Am J Orthod Dentofacial Orthop 2013;143:173-81. Kim SH, Kang SM, Choi YS, Kook YA, Chung KR, Huang JC. Cone-beam computed tomography evaluation of mini-implants after placement: Is root proximity a major risk factor for failure? Am J Orthod Dentofacial Orthop 2010;138:264-76. Morea C, Hayek JE, Oleskovicz C, Dominguez GC, Chilvarquer I. Precise insertion of orthodontic miniscrews with a stereolitho- graphic surgical guide based on cone beam computed tomography data: A pilot study. International Journal of Oral and Maxillofacial Implants 2011;26:860-65. Baumgaertel S, Hans MG. Buccal cortical bone thickness for mini-implant placement. Am J Orthod Dentofacial Orthop 2009;136:230-5. Kim SH, Choi YS, Hwang EH, Chung KR, Kook YA, Nelson G. Surgical positioning of orthodontic mini-implants with guides fabricated on models replicated with cone-beam computed tomography. Am J Orthod Dentofacial Orthop 2007;131 4 Suppl: S82-9. Yu JJ, Kim GT, Choi YS, Hwang EH, Paek J, Kim SH, et al. Accuracy of a cone beam computed tomography-guided surgical stent for orthodontic mini-implant placement. Angle Orthod 2012;82:275-83. Allam E, Windsor LJ, Stone C. Cleft lip and palate: Etiology, epidemiology, preventive and intervention strategies. Anat Physiol 2014;4:1-6. Hamada Y, Kondoh T, Noguchi K, Iino M, Isono H, Ishii H, et al. Application of limited cone beam computed tomography to clinical assessment of alveolar bone grafting: A preliminary report. Cleft Palate Craniofac J 2005;42:128-37. Oberoi S, Chigurupati R, Gill P, Hoffman WY, Vargervik K. Volumetric assessment of secondary alveolar bone grafting using cone beam computed tomography. Cleft Palate Craniofac J 2009;46:503-11. Kiyak HA, Vitaliano PP, Crinean J: Patients expectations as predictors of orthognathic surgery outcomes. Health Psychol 1988;7:251e268. Edwards CB, Marshall SD, Qian F, Southard KA, Franciscus RG, Southard TE. Longitudinal study of facial skeletal growth completion in 3 dimensions. Am J Orthod Dentofacial Orthop 2007;132:762-8.